PeStudio is a unique tool that performs the static investigation of 32-bit and 64-bit executable. Malicious executable often attempts to hide its malicious behavior and to evade detection. In doing so, it generally presents anomalies and suspicious patterns. The goal of the software is to detect these anomalies, provide indicators and score the executable being analyzed. Since the executable file being analyzed is never started, you can inspect any unknown or malicious executable with no risk. 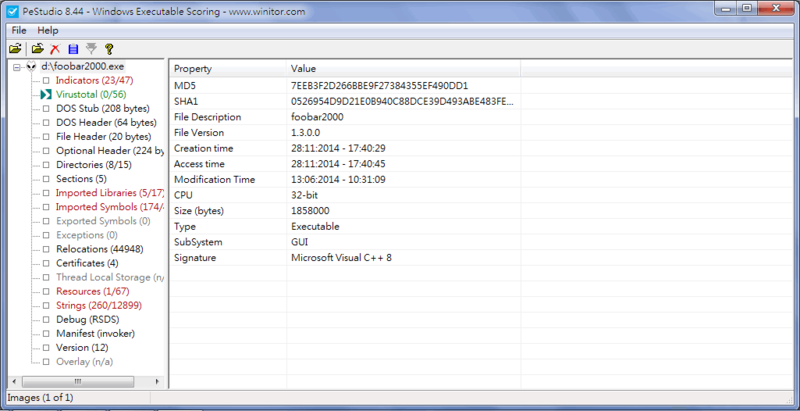 The program is delivered as a ZIP file (MD5: 9177E952F45D589CAC153BE17A0C1A62). Once the package is decompressed, it does not require any installation nor does it change the system it is running on. The program is portable and runs on any Windows Platform. This entry was posted in 軟體情報, 軟體情報, 系統工具 and tagged in 執行檔, PeStudio.